The international community has pledged $3.8bn to tackle the humanitarian crisis caused by the war in Syria – less than half the amount the UN says is needed this year to help the millions of people affected by the ongoing conflict. At the start of the Third International Pledging Conference for Syria – which was held in Kuwait on Tuesday – the UN asked for $8.4bn: $2.9bn for people inside Syria and $5.5bn to help those who have fled to Lebanon, Turkey, Jordan, Iraq and Egypt. The largest sums came from the EU, which pledged $1.2bn, the US ($507m) and Kuwait ($500m). Ahead of this year’s gathering, the German government said it would pledge $277m in new aid. Kuwaiti state media said local charities and aid organisations pledged another $506m just before the conference started. Gulf envoys addressing the conference said the United Arab Emirates pledged $100m, Saudi Arabia $60m, and Norway $93m. The UK has promised $150m. The UN secretary general, Ban Ki-moon, described the Syrian situation as the “worst humanitarian crisis of our time” but said the sums promised represented “very generous pledges”. According to UN estimates, the war has killed more than 220,000 people and displaced 11 million. Nearly 4 million Syrians have fled to five neighbouring countries, where their presence is straining resources and host communities. 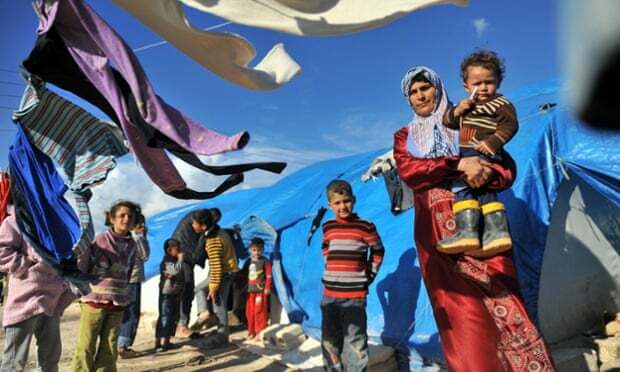 The UN high commissioner for refugees, António Guterres, said the situation for the Syrian people was “unsustainable”. He added that the current UN appeal differed from previous ones because it recognised both the immediate and the longer-term imperatives of responding to the crisis. On Monday, the charity had criticised the international response to the Syrian crisis, saying money pledged was woefully inadequate. At last year’s donors’ conference, about $2.4bn was pledged through the UN – well below the $6.5bn requested. In 2013, $1.5bn was pledged, less than half of the UN’s appeal for $4.4bn. The UN humanitarian office’s Financial Tracking Service said in November that nearly a quarter of last year’s pledges, $585m, remained unfulfilled.